Lovely tulip pattern and in great condition too! This is one of my favourite finds. 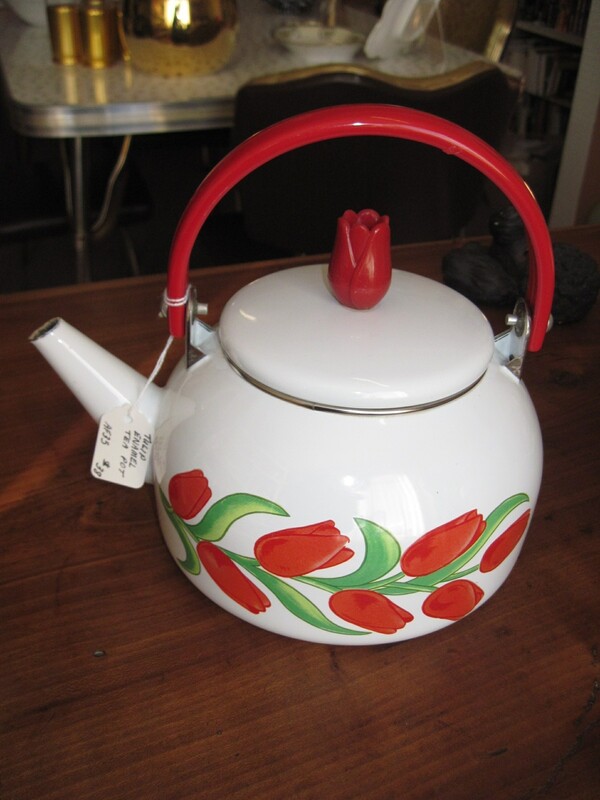 Really cute enamelware teapot with tulips all around and a plastic red tulip handle on the lid. I don’t know the manufacturer of this particular one nor the age but it was too sweet to resist! Note: This item has been SOLD!! I found these two Polka Dotted enamelled pots in a little Antique store while on one of our roadtrips. The store was so jam packed with stuff it was hard to move around in. I loved it!!!! Although I like to keep my booth clean and easily accessible, I love to browse around in over crowded out of the way places. I always think I will find some burried treasure that no one else noticed. Sometimes this strategy works. These two pots were made in Yugoslavia around the 1950’s when polka dotted kitchen ware was all the rage. They have some enamel loss on the edges but still display well and are quite usable. The markings on the bottom show 2 lion heads facing each other and a number along with the printed word Yugoslavia. Please note that the pots and most of the items in the background are now SOLD!!! I still have the punch bowl set.